In April 2012 I was able to travel back to Edmonton, and there I visited with Stylus Pens... a Great Pen Store. 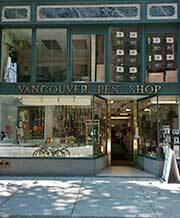 In my city, Vancouver, Vancouver Pen is a Great Pen Store. A great pen store. Great pen stores, or Stores of Note, have a good selection of pens, create a environment that encourages you to try a variety of pens and make a good selection on the right pen for you. Their staff have knowledge about the pens they sell. On-line pen retailers are a good option for a buyer. Sometimes because of location, an on-line purchase is really the only option. 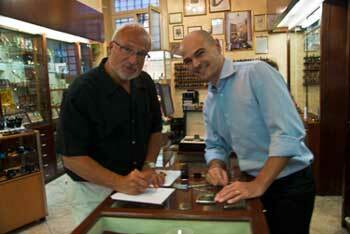 Glenn Marcus and Marco Parascenzo of Novelli Pen in Rome. A Great Pen Store worth a visit. Where possible, I prefer going into a pen store, trying a selection of pens and nibs and then making my selection while having a conversation while I do and building an relationship with staff of the store. On our travels, my wife and I enjoy visiting pen stores. Karen, has a keen eye and can spot a pen store as soon as one is visible. We travel extensively in France and Italy, so much my wife Karen provides travel consulting (www.marcustravel.com) and we have also put together a web site on great trips with a wide range of information at your disposal.